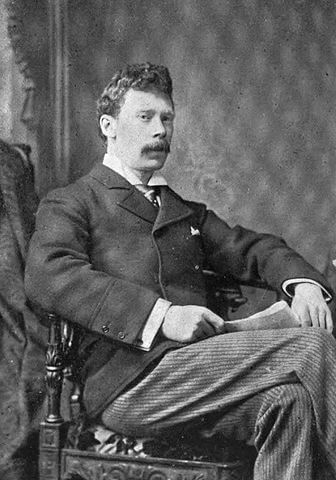 Sir Arthur Quiller-Couch (1863 - 1944) was a Cornish novelist who published under the pseudonym "Q." Though he compiled a number of anthologies of verse and prose, he is best known for The Oxford Book of English Verse (1250-1900), published in 1900, updated in 1918. He's well regarded for his own poetic verses, publishing Poems and Ballads in 1896. Though they never met, he influenced the American author Helene Hanff, who wrote one of our favorite books, 84, Charing Cross Road (1970) and its sequel, Q's Legacy (2012). Quiller-Couch got his "Sir" title when he was appointed King Edward VII Professor of English Literature at the University of Cambridge in 1912, and he published On the Art of Writing (1916), a compendium of his inaugural lectures as the professor of English literature at Jesus College, Cambridge. He published On the Art of Reading in 1920. A collected edition of Q's fiction was published in Tales and Romances (30 volumes, 1928–29). He published a number of stories in Noughts and Crosses: Stories Studies and Sketches using his own name in 1898. Some of our favorite stories include The Omnibus (1898) and The Seventh Man (1936).